These are great to have on hand...mine is stuck to the inside of my spice cabinet! All it requires is your printing paper of choice and a printer! They'd make the perfect companion to bakeware gifts. 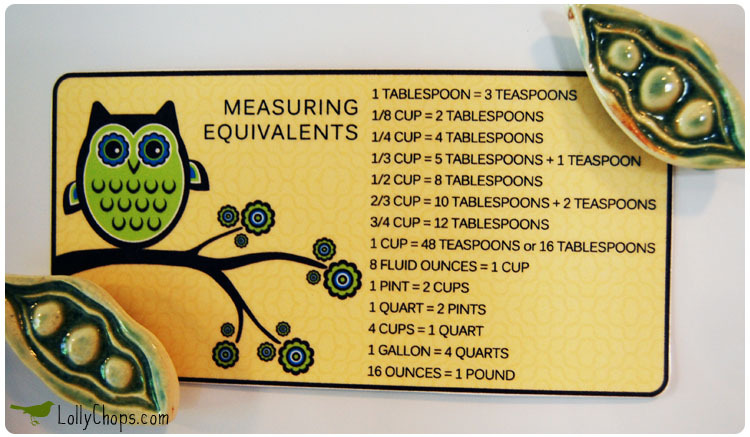 ~Laminate and punch a hole in top so you can attach to a ring of teaspoons! ~Make a magnet and add it to a gift basket. Check out the links below to LollyChops and Martha Stewart...from there you can print out your chart.LollyChops has 3 adorable ones for you to pick from. I chose this cute owl! Martha Stewart also has some free charts available as well as a little bit of further instructions.